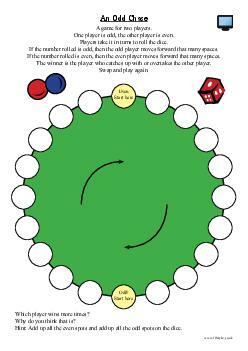 Game using the odd and even numbers on a die. Who wins and why? Pupils should realise that the even numbers on a die are greater than the odd numbers on the die. This worksheet is aimed at students in Year 2. It will also be appropriate for students in other Year Groups, of a similar ability level. It covers the topic Number - multiplication and division.